Product prices and availability are accurate as of 2019-04-19 08:16:08 UTC and are subject to change. Any price and availability information displayed on http://www.amazon.com/ at the time of purchase will apply to the purchase of this product. We took one of our top-selling customer favorite Type-C adapters and made it even better! Introducing our latest Satechi Aluminum Multi-Port Adapter V2, with all the same peripherals that you loved on the previous model but with several changes to ensure a consistent connection and stable data transfer. 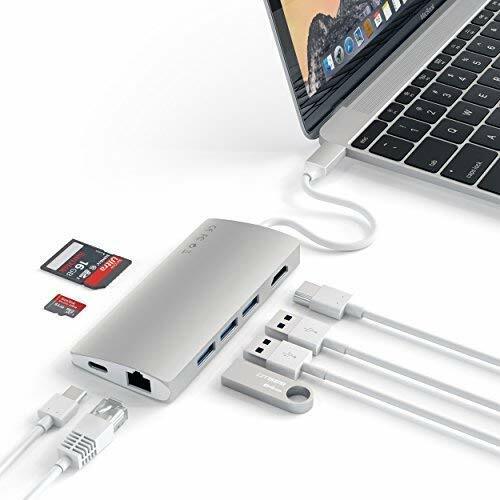 We upgraded the Micro SD card slot and refined our aluminum design, so now it is easier than ever before to add expansion ports to your MacBook/MacBook Pro. Available in two modern colors, silver and space gray. Featuring an upgraded Micro SD card slot and aluminum design for a user-friendly experience. Now you will be able to feel the "click" when your Micro SD card has been properly inserted for a consistent connection. Enjoy beautiful, crisp high-resolution display in up to 4K @ 30Hz resolution by simply connecting your HDMI cable from the Multi-Port Adapter to your monitor. We recommend to use HDMI 2.0 cables. HDMI port requires a direct HDMI to HDMI connection. Don't worry about sacrificing your USB-C port, with the included pass-through charging, you can easily charge your Type-C device while using the other included outlets. Max power output 49W. 2016/2017/2018 MacBook Pro, 2018 MacBook Air, 2015/2016/2017 MacBook, 2017 iMac, iMac Pro, 2018 iPad Pro, Microsoft Surface Go, ChromeBook (only models with DisplayPort over USB-C with Alt mode), Samsung Galaxy Tab Pro S, HP Spectre Convertible (13-AC0XX), Razer Blade laptops, Huawei Matebook and more USB-C laptops with Power Delivery protocol.